On Friday, March 16, faculty and staff from all departments came together to celebrate the achievements of their colleagues and peers at Saint Mary’s Annual Scholars Reception in Claeys Lounge. The event honored faculty members nominated by their peers for their outstanding performances as educators. 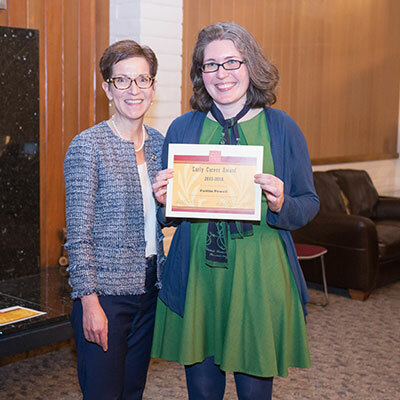 The recipients of 2018 Provost’s research grants were also recognized, as well as 2016-17 sabbatical recipients, whose research projects were represented at the reception through video presentations, posters, and copies of their works. The reception began after an activity-filled workday. Faculty and staff mingled with one another, enjoying wine and hors d'oeuvres. Vice Provost for Academic Affairs Christopher Sindt kicked off the celebration by introducing the award recipients. Management Professor Rebecca Carroll received the Teaching Excellence Award. “To this day, students overwhelmingly refer to her standards and expectations as ‘difficult but fair.’ Rebecca’s teaching has focused on helping people do right by each other,” Sindt said.